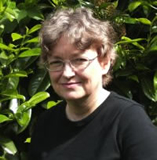 Janet Edwards lives in England. As a child, she read everything she could get her hands on, including a huge amount of science fiction and fantasy. She studied Maths at Oxford, and went on to suffer years of writing unbearably complicated technical documents before deciding to write something that was fun for a change. She has a husband, a son, a lot of books, and an aversion to housework. CLICK HERE FOR MORE STORIES BY JANET EDWARDS. Earth Girl — (2012-2014) Young adult. Publisher: A sensational YA science fiction debut from an exciting new British author. Jarra is stuck on Earth while the rest of humanity portals around the universe. But can she prove to the norms that she’s more than just an Earth Girl?2788. Only the handicapped live on Earth. While everyone else portals between worlds, 18-year-old Jarra is among the one in a thousand people born with an immune system that cannot survive on other planets. Sent to Earth at birth to save her life, she has been abandoned by her parents. She can’t travel to other worlds, but she can watch their vids, and she knows all the jokes they make. She’s an ‘ape’, a ‘throwback’, but this is one ape girl who won’t give in.Jarra invents a fake background for herself – as a normal child of Military parents – and joins a class of norms that is on Earth to excavate the ruins of the old cities. When an ancient skyscraper collapses, burying another research team, Jarra’s role in their rescue puts her in the spotlight. No hiding at back of class now. To make life more complicated, she finds herself falling in love with one of her classmates – a norm from another planet. Somehow, she has to keep the deception going.A freak solar storm strikes the atmosphere, and the class is ordered to portal off-world for safety – no problem for a real child of military parents, but fatal for Jarra. The storm is so bad that the crews of the orbiting solar arrays have to escape to planet below: the first landing from space in 600 years. And one is on collision course with their shelter. Earth Girl is the first book of Janet Edwards’s planned EARTH GIRL trilogy. 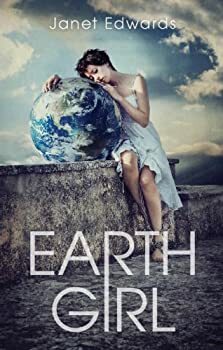 On her website, Edwards reports that both Amazon.uk and Kobobooks have rated the e-book version of Earth Girl as among the Best YA of 2012. I can see why people would like this book, but it was a miss for me.